Concrete is a durable, reliable material for high traffic areas such as driveways, walkways, sidewalks, patios and various other applications. It's important to have a contractor who offers the right solutions for concrete repair and resurfacing. Here at Bowman Masonry & Waterproofing, we give you the best options in concrete repair. 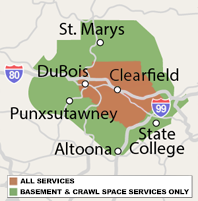 Our services are available throughout Saint Marys, Bellefonte, Altoona, State College, Du Bois and areas nearby. Contact us to see how we can restore your concrete surface, today. It it easy to identify when a concrete surface has been damaged. Concrete that hasn’t been sealed or finished can easily become stained by spilled material or simply by an accumulation of dirt and grime. Concrete surfaces such as sidewalks can sink or shift due to soil compression, soil erosion or frost heaving. They can even crack or become uneven due to a significant amount of weight, ultimately deteriorating the slab altogether, making it useless. Details make a difference. The best concrete repairs depend on a combination of good materials and sound techniques. When you contact Bowman Masonry & Waterproofing about a concrete repair, you can be confident in our solution recommendations. Whether it be an unsightly appearance such as stained or discolored concrete, or a structural safety issue, we can help. Our technicians have the training, tools and experience to assess repair requirements and get the job done right the first time. We want to restore your concrete so that it is aesthetically pleasing, safe to use and long-lasting. 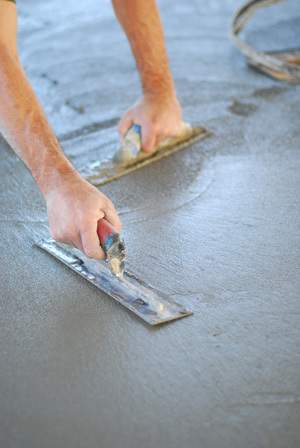 We also offer concrete slab pouring for new concrete slab construction in your area. If you do need a new slab installed, you can count on us to quickly and efficiently provide the service. Repairing your concrete with our experts here at Bowman Masonry & Waterproofing is also an opportunity to upgrade the appearance and functionality of your concrete. Bowman Masonry & Waterproofing specializes in concrete resurfacing for things like a worn concrete patio, which can include decorative upgrades like concrete stamping and staining or installing new concrete pavers. Don't wait for your concrete problem to worsen before deciding to repair it. Bowman Masonry & Waterproofing is your local choice for concrete repair options throughout Greater Clearfield. We offer a wide range of concrete repair solutions like concrete grinding and concrete resurfacing. Call us today at Bowman Masonry & Waterproofing for a free estimate in your area!